The Charm, The Fury, are a metalcore band from Amsterdam, Netherlands. Inspired by bands including Underoath, For Today, Architects and Every Time I Die, the band formed in 2010, and have been impressing audiences at gigs and festivals. Vocalist Caroline Westendorp gives us the Charm with her clean vocals, and the Fury with her aggressive Growls. Those growling or screaming vocals really contain a lot of power and sound fantastic. The use of clean vocals as well gives extra variety and interest. The album kicks off with "A new state of mind". It's a gentle piano melody with gentle string instruments in the background. It gradually builds in power and volume but definitely lulls the listener into a false state of security before the album really kicks off with the title track "A shade of my former self". At that point the band kick in with plenty of power and energy from the guitars and drums. After a short build up, Caroline lets rip with those powerful vocals of hers and that's when you first realise this is a band that are definitely going to go places. I have to be honest and say that I find a lot of metalcore music pretty dull - yes there's lots of power and energy but on CD they just bore me (but can be much better with the energy of a live show). Having said this, there are a few metalcore bands that really do impress me as they manage to stand out from the crowd and manage to keep things interesting. 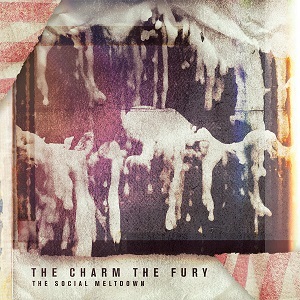 The Charm the fury, definitely fall into this impressive category - the changes of pace, the mix of clean and screaming vocals, and the well written songs mean this is a band that really impresses me. Having listened to the album quite a lot over the last few days, I'll definitely be trying to get to one of their gigs sometime soon.